If you’ve been quilting for any time at all, you probably have fabric scraps, including strips and strings. 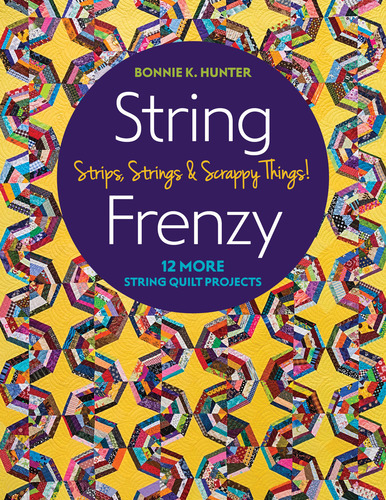 If you’re looking for projects where you can use these bits and pieces, you need to check out the projects in String Frenzy by Bonnie K. Hunter. This latest book by the scrap quilting queen is full of gorgeous patterns, all using leftover strips and strings of fabric. The quilts in this book are large, but could definitely be scaled down to make smaller projects, such as table runners or lap quilts. If you’re familiar with any of Bonnie’s previous books, you’ll know how much information she includes on getting your scrap fabrics organized and ready to be used in projects. This information in itself is worth the price of the book! It’s definitely worth reading all of the helpful content in String Frenzy that Bonnie provides on getting a scrap system going so you can always have your extra fabric pieces ready to use in any project. String Frenzy includes 12 projects from scrap fabric and each pattern follows a similar format with text as well as a section called “At a Glance” for visual instructions. Click on the image below to see more detailed information on String Frenzy and the beautiful quilts in it. Are you a scrap quilter? If so, give me a “yes” in the Comments below. Get your own copy of String Frenzy at https://amzn.to/2I7kEw2 and start clearing out that scrap bin. One of my recent blogposts was all about how to face your quilt, rather than adding a binding to it. If you haven’t yet read that post, you can find it here. This is such a great method for wall hangings as it uses up excess binding strips and small pieces of scrap fabric. It also avoids those pesky mitred corners (if you love mitring your binding corners, I’m sorry). It allows the border or background fabric to flow right to the edge of the project without the “stop” that the binding can cause. Lots of quilters loved this technique and some of them had some questions. As the edges of the facing strips aren’t finished, they wondered if they might fray when washed. Others wanted to know if this technique would work for large bed-sized quilts. To answer all of their questions, I created another video and you can watch it by clicking on the image below. Have you ever tried this technique on one of your quilt projects? Let me know how that worked for you in the Comments below. Do you have a favourite coffee mug or tea cup that is chipped, but you just can’t bear to throw it out? Maybe you picked up a teacup at an estate sale (like that’s every happened to me!) just because you liked it and don’t know what to do with it. 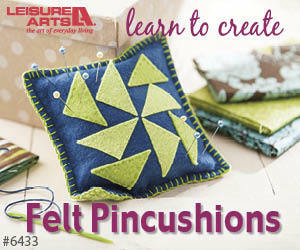 Let me show you how to make a pincushion out of it. We’ll be cutting a circle out of the fabric that should be at least three times the diameter of the top of the mug or cup. This will vary depending on the mug or cup you are using. Cut out the circle of fabric and run a basting stitch about ½” in from the raw edge. Be sure to knot your thread first and use large running stitches. Pull the thread out to the outside of the circle and do not knot it yet. Pull the basting stitching a bit so that the pincushion is starting to form and so that you can stuff it. Stuff the circle. You will need to pull the basting stitching in as you go along to contain it. Once the circle is filled, pull the basting stitch tight and knot off. Now get your glue gun fired up! Run a line of glue inside the cup, partway down the side – not too close to the top as we don’t want to see the glue. Press the pincushion down inside the cup or mug and squish it around until it is the way you like it. If you are using a teacup and have a saucer, glue the saucer to the bottom of the cup. For extra decoration, you could glue trim or ribbon, bows, etc. around the top edge of the cup or mug – buttons or other decorative items. For a step-by-step tutorial on creating a teacup or mug pincushion, click on the image below. Enjoy your lovely personalized just for you pincushion! Have you ever created a pincushion using a chipped mug or one that you’ve bought at the second hand shop? Leave me a comment below to tell me about your mug or teacup pincushion experience. In Scrap-Basket Bounty, Kim Brackett shows you how to use your fabric scraps to create one block and then combine a number of these blocks to make a quilt. There is definitely an advantage to making one block several times to create a project. It allows you to get very good at your ¼” seams! The projects in this book are lap-sized quilts or larger. Each of the projects uses a different block, but every block is square, with some being 8” x 8” or 10” x 10”, for example. While there are 16 projects in Scrap-Basket Bounty, there are really many more patterns than this. Kim provides alternative design layouts with each project so you can decide which one you want to make. By simply turning the blocks, you create a totally different-looking design. I love this idea! Kim shows you how to ensure that your quilt will turn out well using your scrap fabrics by explaining the importance of contrast between the main fabrics and the background fabrics. If you don’t have this contrast, the block design won’t be obvious – and all of your hard work won’t have turned out the way you wanted it to. The designs in Scrap-Basket Bounty are easy enough that any level of quilter could make them and they’re a great way to use up scraps. I really like Kim’s idea of taking one simple block and creating a variety of quilt designs from it. While Kim provides 3 layouts for every project, you will probably be able to come up with more on your own. You could even create totally different looking quilts just by switching up the light and dark fabrics in these designs. To see more of Scrap-Basket Bounty, click on the image below. If you like pieced quilts and have lots of fabric scraps, check out Scrap-Basket Bounty by Kim Brackett.